Our Products >> CHRISTI'S DOWNLOADABLE PATTERNS! "2 FACED CABLE SCARF" "ALAYNA'S HAT"
"Christi's NO-SEW SWEATER" Downloadable Video/Pattern "CHUNKY CABLE CAP"
"CROCHET COVER-UP" "CROCHET JUSTIN'S HAT"
"GOT ROCKS COVER UP" "It's a HOODIE SCARF-n-COWL KIT"
"It's a HOODIE SCARF-n-COWL" "K.Y.B. HAT"
"LACEY LEAF SCARF" "LOOPTY-LOU SCARF/SHAWL"
"NO-SWEAT SUMMER SWEATER" "SASSY SANTA HAT"
"SCANT YARN SCARF" "SHRUG PLUS"
LAKESIDE ALL SEASON SHRUG/VIDEO NEW & IMPROVED "KNITTERS-MITTS"
"BACK PACK CONVERTIBLE" "CABLES UNTANGLED"
Very Easy Knit 'n Felt No sewing, using large needles and great yarn! Here is a super easy sweater or vest with a well placed cable you can knit up in a weekend and actually wear. 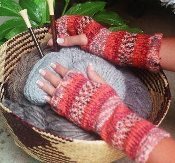 Fun for all skill levels featuring hand painted Colinette yarn knit on #17 circular needles. One size fits most. "CONVERTIBLE MITTENS" "CORY'S FLAP HAT"
"EWE NAME IT BAG!" "EWE-SHAPE' FELT HAT"
"FAT BOTTOM BAG" "FLAT BOTTOM BAG"
Quick 'n Easy Knit Pattern Very Easy Knit 'n Felt Featuring "Christi's Quick Knit Kit"
"HOBO BAG" "KNITTED JUSTIN'S HAT"
"NO-BRAINER BILL HAT" "PINEAPPLE BAG"
"ROSE TRELLIS SHAWL" "SECRET SPACE BAG"
Just for "EWE BAG" "PUNKIN' PURSE"
"Christi's NO-SEW SWEATER" "SHAWL with a NEW ANGLE"